• Justin Belton, URA Department of Housing, Residential Facade Improvement Program For Neighborhood Property Owners up to 5k matching grant for street facing façade improvement. These programs are offered in 6 neighborhoods throughout Pittsburgh, one of them being The Upper Hill. This meeting is opened to the public and community members. 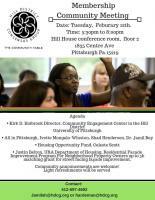 Please share with your family, networks, and encourage others to come learn more about important community initiatives and the Equitable Development: Path to an All-In Pittsburgh.